SEs and Classics and PowerBooks, Oh My! It's just a year since we began My First Mac. This is the 41st article in the series - and more stories keep coming in. We'd be pleased to know your story. In July 1996, we went to my aunt's house. She has a Performa 6360, and there was an old Mac SE next to it. She just gave us the SE, and we drove back to San Francisco with HyperCard 1.01, Microsoft Word 4, Excel, and lots of other software. I think was a special SE, because it had a stock 40 MB hard drive and System 4.3. Then, after a long time, I got a Classic II from my school. It had 4 MB of memory and a 40 MB hard drive. I put System 7.5 on it. Big mistake! With 4 MB of memory, it takes a full 5 minutes to start! In August 1999, I went to my godparents house. My godfather had a PowerBook 3400c/240. On a little table, I saw a little, thin dark gray thing. It had an Apple logo! I was attracted. I asked him, "What is this?" He opened it, and there it was: a PowerBook 140! At this point, I was itching to get it. After spending the night, he said yes. He took the SCSI adapter and hooked up an external LaCie 50 MB drive and backed up everything. It was mine -- an old PowerBook with a 15 minute battery was mine! I literally brought it everywhere with me. In January 2000, he came to our house. He told me the La Cie drive was mine, and he also was carrying a big blue bag. I thought he had brought his PowerBook, but no! Ooooo! An SE/30! The only reason he gave it to me because it was "broken." Nope. It booted! Wow! 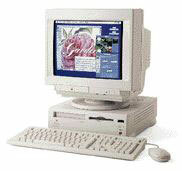 Quicken 6, Excel 4, Word 5, System 7.0.1, 8 MB of memory, 80 MB hard drive, Aldus PageMaker 4.2. I was soooo happy! But after we went out for breakfast, there was a tragedy. The screen, instead of a nice gray, there was one big white line! I called a store that will troubleshoot free, as opposed to the 50 buck fee that Apple charges. He walked me through it. He told me what was wrong and to bring it up there. He opened the case. Ah! It looked really weird. He took a ball point pen and circled a couple of connections. There were cracks around them! My dad re-soldered them, as I barely knew how to solder. We put it all back together, as I prayed, and it worked. But there was one more problem: a bad F-line! Ah, crud, I have to install a new system! My friend and I took the Finder out of the System Folder, and I accidentally restarted it. Now I have to get a stinking boot disk! I suddenly remembered! My LaCie Tsunami! But it had never worked with the SE/30. Well, it is worth a try. It worked! But that video card! I wish that thing knew there was no monitor connected! Right now, it takes me an hour to get the monitors control panel on the internal screen. To make a long story short, I was anxious and bored. Then in early March, I called that store. He said he had a PowerBook 165c with a broken daughterboard. I wanted it. I got it. I was happy. I was also sick. I had bought an Apple CD 300 for 20 bucks at that store. That is how I got it System 7.5.3. And right now, it is downstairs, but still being used pretty much every day. The Classic II is mostly for my brother. The SE only gets used occasionally. Every port on the SE/30 is used. I have a Global Village 14.4 modem, an Apple 800k external floppy drive, the LaCie Tsunami hard drive, an Apple Color OneScanner, the AppleTalk cable to the PowerBook 140, and the ADB ports. I am trying to make an Apple Museum, but I am not nearly as far as some people.